There are more than 400 binary options trading platforms in the industry today. This means that for a trader who is looking for trading software, he will have a very wide pool from which to choose from. This could be a problem because it is difficult to ascertain which one is legit and which one is not. This review will help you determine if one of these platforms, Binary Meta Bot is worth making investments in. There is a website known as BritishTradersAssociation.com that claims that Binary Mega Bot is a legitimate binary options trading system. This is not authenticated yet and the website is not widely accepted as an authority in binary trade matters nor does it speak for traders in the binary options marketplace. They cannot therefore claim to be the final authority to declare this program legit or not. 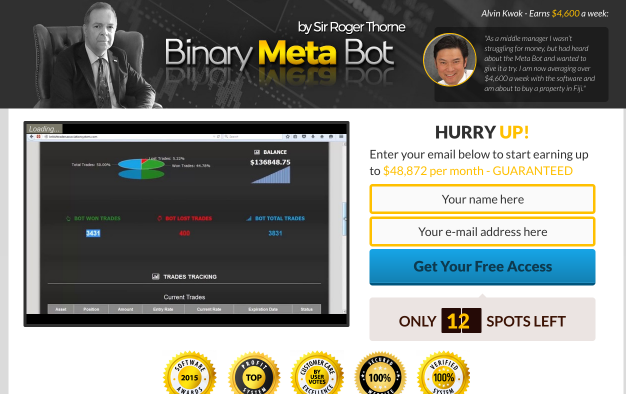 What is Binary Meta Bot? This binary options program was developed by somebody who is said to be named Sir Roger Thorne. Sir Thorne is said to have over thirty years’ experience in the financial markets under his belt. It is this experience that allegedly prompted him to develop Binary Meta Bot for traders who would like to draw form his experience. For now, the binary robot is only open for a small number of people. It is not a mass trader recruitment thing. It is for this reason that you are being asked to register as a trader with them to take advantage of these few places available. How does Binary Meta Bot work? As a binary options robot, Binary Meta Bot generates signals, executes trades and makes profits for members without them having to make much effort to make this happen. How they generate signals is still not yet known to the public. Their promotion just says it was created by an experienced trader and he has all the systems necessary to produce signals that have a success rate of 98.7%. This will be one of the highest ever declared success rate in the binary options history. How this is made would be the stuff of financial news headlines around the world. The promoters of this program claim time and again that the brains behind this software, Sir Thorne, has a unique insight and complicated systems that produce winning trades after winning trades. What they do not tell is what these systems are all about. Apparently, all you need to do is to believe this information and open an account. If it was created by a trader so successful and influential that he was knighted, it must be legit and very effective. There must be traders who are influenced by such information. That is why it is promoted so. Opening an account with Binary Meta Bot is a piece of cake. There is not much to do other than fill in your vital information like your name and your email address. After this, you will land on another page where you will be required to open a trading account with a broker that the robot will direct you to. Seems like with this program, you cannot import your broker from another trading platform. This implies that you have to make do with the one that you are directed to open your account with and none else. When this is done, you will make an initial deposit which will not be less than $250. This is just the minimum deposit; you can make a larger deposit depending on how much you would like to invest in this program. Your profits will depend on the amount of deposit that you will post; the more the better. Benefits of open an account with Binary Meta Bot? Very high accuracy rate: A 98.7% accuracy rate is promoted for this robot. This is just about 1% less of a perfect accuracy rate. If this rate is proven to be true, you will be making at least 98 accurate trades out of every 100. This is unprecedented in the binary options industry. This is the stuff that will make you a millionaire in just a few months of constant trades. What is left of this claim is to have this percentage proven by independent traders. Professionalism: As a trader with Binary Meta Bot, you are assured of a professionally ran program. This is because the programs creator has over thirty years’ experience in the financial markets trading. You will see this experience in the running of the program. Great signals: With the sophisticated systems that have been developed by Sit Thorne over the years, and the same ones which are always being fine-tuned and updated, you will be trading in one of the most accurate signal generator of in the business. This should assure you of a good return on investment every time. Web-based: The Binary Meta Bot is web based. This means that you will not have to bother with downloading software to your PC. It also means that you do not have to be stuck with one PC to do all you need to do with your trading account. Being web-based, the software is easily accessible form all devices which are made for internet. This will include your laptop, your smart phones, and your tablets. Client support: Binary Meta Bot assures you of effective customer support. This will be for all of your enquiries about trading on their platform as well as any queries that you may have about your trading account, profits, withdrawals and bonuses. Secure methods of money transfer: With the increase of fraudulent practices in the money transfer and credit card fraud, it is important that you use the most secure methods that you will use to transfer your funds to and from the program. This is what Binary Meta Bot is promising you. With the transfer methods that they use, you will not need to be worried about your money anymore. Bonuses: Big bonuses are given to all joining members. These bonuses will be just like free funds to trade with. 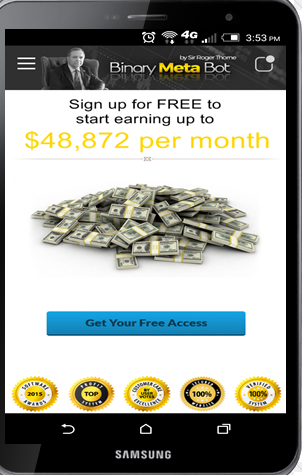 You will be in a position to make lots of money with these bonuses. There will also be more bonuses offered form time to time. Is this Binary Meta Bot legit? The creator of this program, the one and only Sir Roger Thorne seems not to exist beyond this trading platform. For a trader who has been knighted for his work, it is inconceivable that he is not mentioned anywhere having attended an event, quoted saying something or appeared in a profile anywhere. Scouring the records of the City of London records, you will not find the famous Sit Thorne anywhere. This leads to the conclusion that such a person does not exist in real life. A careful look at him also reveals that he also appears with a different name as the creator of another questionable binary options robot. The 98.7% accuracy rate is not possible. There is no system that has been created and proven to hit such levels that are almost perfect. If you are a trader that is attracted to these claims, you are well advised to hit the brakesif you were rushing to open your trading account here. These claims are not factual at all. With binary Meta Bot, there is the permanent claim that this program was developed for just a few people. This too is not true. You would expect that a binary options program that has an almost perfect score with accuracy levels to be grabbed like hot cakes and all the available positions filled within minutes. If this program was meant to be a few people, why has it never reached the limit? It means that there is nothing like that and traders are being invited to sign up en masse. Binary Meta Bot promises so much but it does not deliver a fraction of what it promises traders. To date, there is no independent trader who has reported hitting anything close to 98.7% accuracy rate that this program promotes too much. Also, the fact that the so called Sir Rogers Thorne has been exposed as a fake paints a bad picture of the whole software. What else could tell that this program is questionable? The best thing is not to wait and find out. Give the program some time to make their case that they are worth your while. In the meantime, open your trading account with Binary Option Robot instead. This an established trading platform where you will not have to worry about integrity and what does not add up. With great signals, reputable brokers, a healthy ROI and helpful client support, this is where your trading account ought to be. With Binary Option Robot, your investments will be in the right hands.